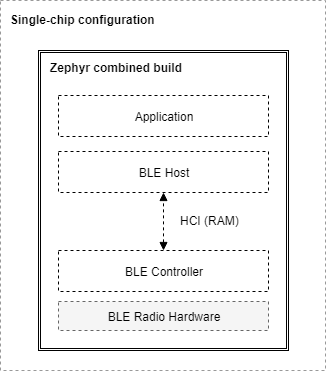 This page describes the software architecture of Zephyr’s Bluetooth protocol stack. Zephyr supports mainly Bluetooth Low Energy (BLE), the low-power version of the Bluetooth specification. Zephyr also has limited support for portions of the BR/EDR Host. Throughout this architecture document we use BLE interchangably for Bluetooth except when noted. Host: This layer sits right below the application, and is comprised of multiple (non real-time) network and transport protocols enabling applications to communicate with peer devices in a standard and interoperable way. Controller: The Controller implements the Link Layer (LE LL), the low-level, real-time protocol which provides, in conjunction with the Radio Hardware, standard interoperable over the air communication. The LL schedules packet reception and transmission, guarantees the delivery of data, and handles all the LL control procedures. Radio Hardware: Hardware implements the required analog and digital baseband functional blocks that permit the Link Layer firmware to send and receive in the 2.4GHz band of the spectrum. The Bluetooth Specification describes the format in which a Host must communicate with a Controller. This is called the Host Controller Interface (HCI) protocol. HCI can be implemented over a range of different physical transports like UART, SPI, or USB. This protocol defines the commands that a Host can send to a Controller and the events that it can expect in return, and also the format for user and protocol data that needs to go over the air. The HCI ensures that different Host and Controller implementations can communicate in a standard way making it possible to combine Hosts and Controllers from different vendors. Single-chip configuration: In this configuration, a single microcontroller implements all three layers and the application itself. This can also be called a system-on-chip (SoC) implementation. In this case the BLE Host and the BLE Controller communicate directly through function calls and queues in RAM. The Bluetooth specification does not specify how HCI is implemented in this single-chip configuration and so how HCI commands, events, and data flows between the two can be implementation-specific. This configuration is well suited for those applications and designs that require a small footprint and the lowest possible power consumption, since everything runs on a single IC. Dual-chip configuration: This configuration uses two separate ICs, one running the Application and the Host, and a second one with the Controller and the Radio Hardware. This is sometimes also called a connectivity-chip configuration. This configuration allows for a wider variety of combinations of Hosts when using the Zephyr OS as a Controller. Since HCI ensures interoperability among Host and Controller implementations, including of course Zephyr’s very own BLE Host and Controller, users of the Zephyr Controller can choose to use whatever Host running on any platform they prefer. For example, the host can be the Linux BLE Host stack (BlueZ) running on any processor capable of supporting Linux. The Host processor may of course also run Zephyr and the Zephyr OS BLE Host. Conversely, combining an IC running the Zephyr Host with an external Controller that does not run Zephyr is also supported. When using a Zephyr Host (left side of image), two instances of Zephyr OS must be built with different configurations, yielding two separate images that must be programmed into each of the chips respectively. The Host build image contains the application, the BLE Host and the selected HCI driver (UART or SPI), while the Controller build runs either the hci_uart, or the hci_spi app to provide an interface to the BLE Controller. This configuration is not limited to using a Zephyr OS Host, as the right side of the image shows. 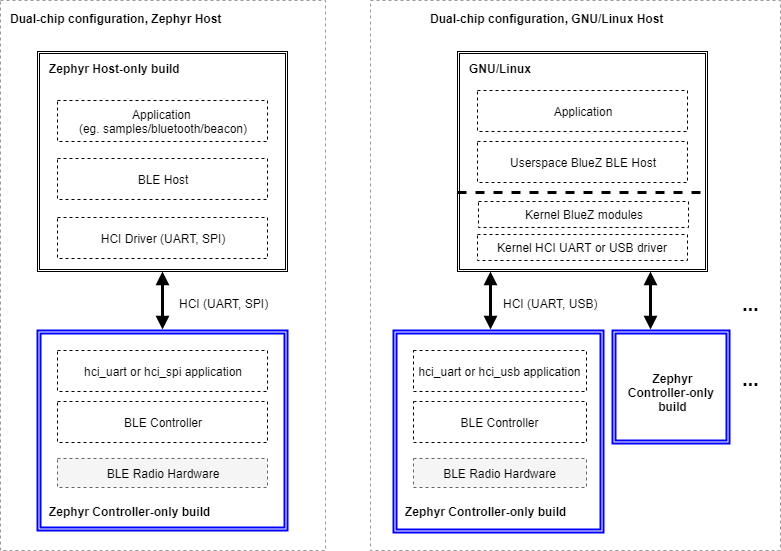 One can indeed take one of the many existing GNU/Linux distributions, most of which include Linux’s own BLE Host (BlueZ), to connect it via UART or USB to one or more instances of the Zephyr OS Controller build. BlueZ as a Host supports multiple Controllers simultaneously for applications that require more than one BLE radio operating at the same time but sharing the same Host stack. The host stack. This is where the HCI command and event handling as well as connection tracking happens. The implementation of the core protocols such as L2CAP, ATT, and SMP is also here. Bluetooth Controller implementation. Implements the controller-side of HCI, the Link Layer as well as access to the radio transceiver. Public API header files. These are the header files applications need to include in order to use Bluetooth functionality. HCI transport drivers. Every HCI transport needs its own driver. For example, the two common types of UART transport protocols (3-Wire and 5-Wire) have their own drivers. Sample Bluetooth code. This is a good reference to get started with Bluetooth application development. Test applications. These applications are used to verify the functionality of the Bluetooth stack, but are not necessary the best source for sample code (see samples/bluetooth instead). Extra documentation, such as PICS documents. The Bluetooth Host implements all the higher-level protocols and profiles, and most importantly, provides a high-level API for applications. The following diagram depicts the main protocol & profile layers of the host. Bluetooth Host protocol & profile layers. Lowest down in the host stack sits a so-called HCI driver, which is responsible for abstracting away the details of the HCI transport. It provides a basic API for delivering data from the controller to the host, and vice-versa. Each role comes with its own build-time configuration option: CONFIG_BT_PERIPHERAL, CONFIG_BT_CENTRAL, CONFIG_BT_BROADCASTER & CONFIG_BT_OBSERVER. Of the connection-oriented roles central implicitly enables observer role, and peripheral implicitly enables broadcaster role. Usually the first step when creating an application is to decide which roles are needed and go from there. Bluetooth Mesh is a slightly special case, requiring at least the observer and broadcaster roles, and possibly also the Peripheral role. This will be described in more detail in a later section. Most Zephyr-based BLE devices will most likely be peripheral-role devices. This means that they perform connectable advertising and expose one or more GATT services. After registering services using the bt_gatt_service_register() API the application will typically start connectable advertising using the bt_le_adv_start() API. There are several peripheral sample applications available in the tree, such as samples/bluetooth/peripheral_hr. Central role may not be as common for Zephyr-based devices as peripheral role, but it is still a plausible one and equally well supported in Zephyr. Rather than accepting connections from other devices a central role device will scan for available peripheral device and choose one to connect to. Once connected, a central will typically act as a GATT client, first performing discovery of available services and then accessing one or more supported services. To initially discover a device to connect to the application will likely use the bt_le_scan_start() API, wait for an appropriate device to be found (using the scan callback), stop scanning using bt_le_scan_stop() and then connect to the device using bt_conn_create_le(). If the central wants to keep automatically reconnecting to the peripheral it should use the bt_le_set_auto_conn() API. There are some sample applications for the central role available in the tree, such as samples/bluetooth/central_hr. An observer role device will use the bt_le_scan_start() API to scan for device, but it will not connect to any of them. Instead it will simply utilize the advertising data of found devices, combining it optionally with the received signal strength (RSSI). A broadcaster role device will use the bt_le_adv_start() API to advertise specific advertising data, but the type of advertising will be non-connectable, i.e. other device will not be able to connect to it. Connection handling and the related APIs can be found in the Connection Management section. To achieve a secure relationship between two Bluetooth devices a process called pairing is used. This process can either be triggered implicitly through the security properties of GATT services, or explicitly using the bt_conn_security() API on a connection object. To achieve a higher security level, and protect against Man-In-The-Middle (MITM) attacks, it is recommended to use some out-of-band channel during the pairing. If the devices have a sufficient user interface this “channel” is the user itself. The capabilities of the device are registered using the bt_conn_auth_cb_register() API. The bt_conn_auth_cb struct that’s passed to this API has a set of optional callbacks that can be used during the pairing - if the device lacks some feature the corresponding callback may be set to NULL. For example, if the device does not have an input method but does have a display, the passkey_entry and passkey_confirm callbacks would be set to NULL, but the passkey_display would be set to a callback capable of displaying a passkey to the user. Encryption but no authentication (no MITM protection). Encryption and authentication using the legacy pairing method from Bluetooth 4.0 and 4.1. Encryption and authentication using the LE Secure Connections feature available since Bluetooth 4.2. Mesh has its own security solution through a process called provisioning. It follows a similar procedure as pairing, but is done using separate mesh-specific APIs. L2CAP stands for the Logical Link Control and Adaptation Protocol. It is a common layer for all communication over Bluetooth connections, however an application comes in direct contact with it only when using it in the so-called Connection-oriented Channels (CoC) mode. More information on this can be found in the L2CAP API section. The Generic Attribute Profile is the most common means of communication over LE connections. A more detailed description of this layer and the API reference can be found in the GATT API reference section. Mesh is a little bit special when it comes to the needed GAP roles. By default, mesh requires both observer and broadcaster role to be enabled. If the optional GATT Proxy feature is desired, then peripheral role should also be enabled. The API reference for Mesh can be found in the Mesh API reference section. Once enabled, it is the responsibility of the application to call settings_load() after having initialized Bluetooth (using the bt_enable() API).